The Gulf of Mexico oil spill continues, unabated: A giant, 40-foot-tall containment chamber got junked up with ice crystals and failed to staunch the leak. BP has already started drilling a “relief well” in the hopes of diverting oil and allowing the original leak to be plugged. Trouble is, the new relief well will take months to complete. 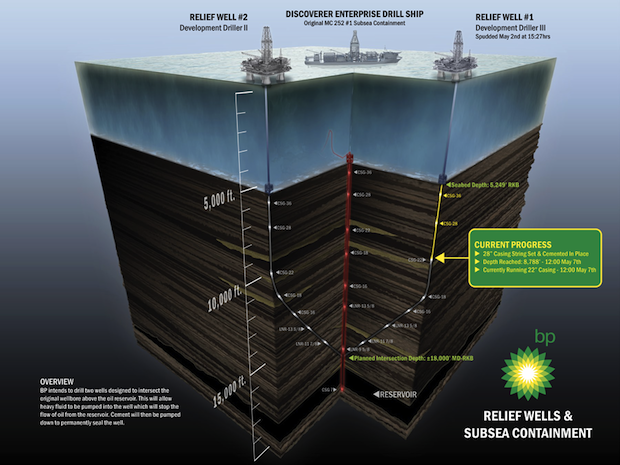 Frankly, it would have been great if BP applied some of their petro-dollars to getting this information out sooner–that way, we wouldn’t have had to rely on the bits and pieces offered up by the media, which failed to give a good understanding of the technical complexity of the operations. Actually, focus on the oil. Make that stop, pretty please?